Want to land a job in education? Get started by teaching yourself how to write a job-winning resume by checking out this sample. If you're looking for teaching jobs, ask yourself: Does your resume get extra credit, or is it barely passing? To be considered for top teacher jobs, it helps to have a resume that puts you at the head of the class. For writing tips, view this sample resume for a teacher, then download the teacher resume template in Word. You can also see a sample resume for an elementary school teacher here. Jobs for teachers are projected to grow by 8% (or 76,800 jobs) from 2016 through 2026, according to the Bureau of Labor Statistics (BLS). You'll find the highest level of employment for this job in the following states: Texas, California, New York, Ohio, and Pennsylvania; and in the following metropolitan areas: New York City, Los Angeles, Houston, Chicago, and Dallas. As a teacher, you can expect to earn a median wage of $59,170 per year, according to the BLS. Student-centered educator with public and private teaching experience that spans both special education and inclusive classrooms as well as one-on-one settings. Deeply committed to optimizing student success, IEP progress and learning outcomes for K-12th graders on the autism spectrum. 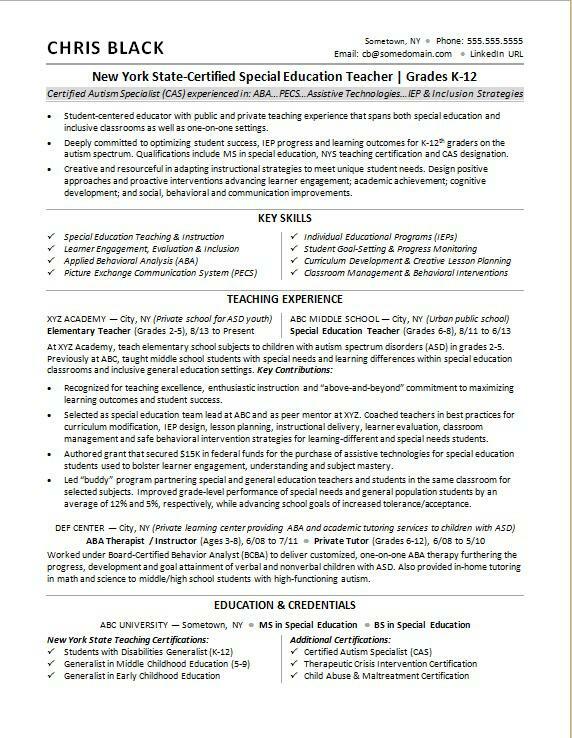 Qualifications include MS in special education, NYS teaching certification and CAS designation. Creative and resourceful in adapting instructional strategies to meet unique student needs. Design positive approaches and proactive interventions advancing learner engagement; academic achievement; cognitive development; and social, behavioral and communication improvements. Recognized for teaching excellence, enthusiastic instruction and “above-and-beyond” commitment to maximizing learning outcomes and student success. Selected as special education team lead at ABC and as peer mentor at XYZ. Coached teachers in best practices for curriculum modification, IEP design, lesson planning, instructional delivery, learner evaluation, classroom management and safe behavioral intervention strategies for learning-different and special needs students. Authored grant that secured $15K in federal funds for the purchase of assistive technologies for special education students used to bolster learner engagement, understanding and subject mastery. Led “buddy” program partnering special and general education teachers and students in the same classroom for selected subjects. Improved grade-level performance of special needs and general population students by an average of 12% and 5%, respectively, while advancing school goals of increased tolerance/acceptance. Worked under Board-Certified Behavior Analyst (BCBA) to deliver customized, one-on-one ABA therapy furthering the progress, development and goal attainment of verbal and nonverbal children with ASD. Also provided in-home tutoring in math and science to middle/high school students with high-functioning autism. You probably tell your students to double-check their assignments before handing them in, right? You could benefit from taking your own advice. The last thing you want to do is apply for a job in education with a subpar resume. Could you use a professional assessment? Get a free resume evaluation today from the experts at Monster's Resume Writing Service. You'll get detailed feedback in two business days, including a review of your resume's appearance and content, and a prediction of a recruiter's first impression. Make sure you're handing in A+ work.